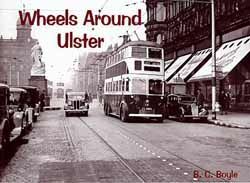 Many familiar names including H. M. S. Catherwood, the Londonderry & Lough Swilly Co. and the Belfast Omnibus Co. are featured in this volume of Wheels, but it would be a mistake to assume that only buses are to be found here. Amongst other modes of transport are the railways, with rolling stock from several different companies represented; Moffet, Chamberlain and McCreary trams; many of the trolleybuses which succeeded them, together with cars, lorries and even the odd bicycle. Donegall Square, Smithfield bus station, Gelston's Corner, Castle Place and Bellvue are some of the Belfast locations appearing in the book, whilst towns outside the city include Portstewart, Bangor, Banbridge, Lisburn, Ballymena, Portrush, Dundonald, Gilford and Londonderry.